I cannot adequately convey the frisson of joy I feel when I first see asparagus shoots emerging on my allotment plot, the Circus Garden. To me it’s a signal that summer is truly on its way. And of course, you simply cannot beat the taste of freshly picked and steamed asparagus – sweet, succulent and slightly grassy. On a good day I can cut the asparagus, leap on my bike, quickly cycle home from the allotment and have it in and out of the waiting steamer and on to plates, all within fifteen minutes. Bliss! For me, part of the fundamental charm and allure of asparagus is its very short growing season – in most cases a window of just seven or eight weeks. Asparagus, I believe, should be celebrated and venerated during that short period and then left as a fond, hankering memory until the following year. In the lengthy gap between asparagus seasons there are plenty of other seasonal crops we can turn our love and attention to, and I will be focusing on these in future posts. That’s how we used to do things, cooking by the seasons. But of course we now live in an era of year-round supermarket-supplied asparagus. By far the largest exporter of asparagus to the UK these days is Peru. Just think of the 6,000 air miles it takes to get it here – is it any wonder that this Peruvian all-year-round supermarket asparagus is a tawdry parody of the real thing – dry, woody and bland? Why do we bother with it? To me it demeans the memory of real home-grown asparagus. The Peruvian asparagus industry has grown exponentially on the back of foreign aid grants which have been closely tied in to the production of food for export. Initially this was intended to encourage farmers away from growing opium poppies but it also had the unintended consequence of encouraging other farmers to produce asparagus for export instead of growing food for local consumption. It has been the country’s private sector agribusinesses that have benefitted most from Peru’s asparagus export boom whilst the pay of workers in the industry has been cut in recent years. According to the charity Progressio, in Peru “there is huge inequality between rich and poor. Indigenous people are largely excluded from both money and power”. The asparagus industry is also causing serious environmental damage to the Ica Valley, the heart of Peru’s asparagus growing industry, where the water table has been dramatically lowered by the diversion of precious water to asparagus crops. This is now beginning to interrupt the availability of drinking water to the local population. All of this has arisen through our apparently insatiable appetite for an out of season poor-relation to our own asparagus. We can do something about this illogical and unsustainable state of affairs. 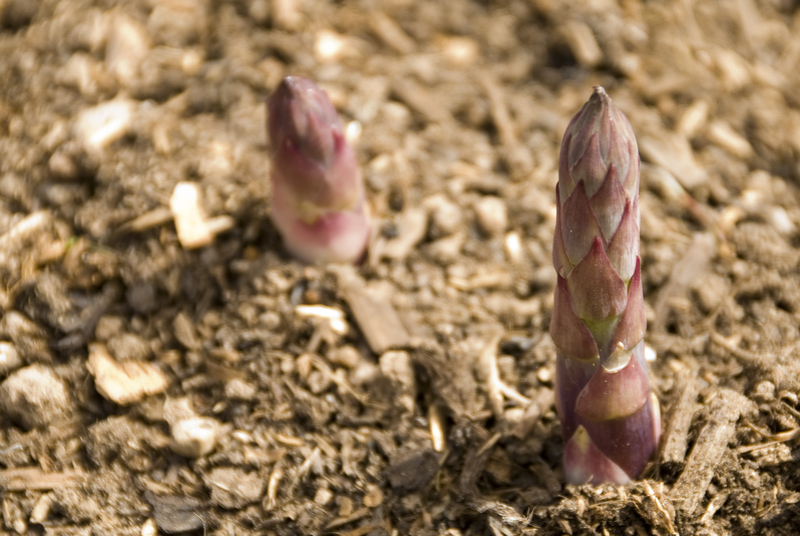 Firstly, if you aren’t fortunate enough to grow it yourself go out this week and buy the freshest in-season locally grown asparagus you can find and then enjoy it as it was always meant to be enjoyed – fresh. Secondly. when the season is over, don’t demean your tastebuds and don’t contribute to the growing problems caused by the West’s skewed foreign aid system by buying the inferior imported stuff. OK, I think it’s time to put the soap box away, put the apron on and cook with this early star of the vegetable growing calendar. Truly fresh asparagus is pretty fantastic all on its own, or simply drizzled with lemon or melted butter or served with a hollandaise sauce, but this is how I sometimes serve it. It’s still a relatively simple recipe, with just a few ingredients, designed to give the asparagus the starring role. It’s quick to make and is perfect as a light lunch, brunch or supper for eating out in the garden on a sunny day. I have even been known to eat it for breakfast. 1. With this recipe you need to prepare as much as you can before the final bit of cooking. 2. Preheat the oven to 180°C. For the dressing, put the olive oil, water and lemon juice in a bowl and whisk until emulsified. Whisk in in the chopped mint. Set aside. 3. Place the cubes of bread in a bowl with the olive oil and mix thoroughly, so that each cube is coated in oil. Tip these croutons onto a baking sheet and place in the oven until they have become golden and crisp. Tip onto kitchen paper and set aside. 4. Remove any woody stems from the asparagus (do this by holding the asparagus spear in one hand about two thirds of the way down from the delicate tip. In the other hand hold it near the base. Gently bring your hands towards each other, bending the asparagus spear until it snaps. The lower portion is the woody stem and should be placed in your compost recycling). 5. If, like me, you are fortunate enough to have an asparagus steamer all well and good. Otherwise find a deep pan and fill it to around 5cm depth with boiling water placed over a moderate heat. Carefully place the asparagus, stems down, into the water. Cover the pan and steam for around 3 minutes. By this time the asparagus should be tender but still retaining a little bite. Remove from the pan and drain. 6. Bring a separate pan of water to the boil. Reduce to a simmer, give the water a good swirl and then drop in the eggs one by one. Cook for 3-4 minutes until ready and remove with a slotted spoon. 7. To serve, place five asparagus stems on each plate. Carefully place a poached egg on the asparagus, drizzle over the mint dressing and gently scatter with the croutons and Parmesan shavings. I LOVE THIS BLOG – it combines so many things about which I am passionate – food, food politics, food and politics – brilliant Steve. Please keep me posted! Great stuff Steve! The site looks fantastic and I’m looking forward to loads of fab and exotic recipes! Your words and photos are as delicious as your recipe, Steve. Food for mind and body. Thanks for educating me about Peru and thanks for a clear recipe. I may be buying locally grown asparagus this weekend as you’ve inspired me. I happen to be having asparagus this very evening along with carrots and parsnips (the latter roasted with maple syrup) as the vegetables for our dinner. Personally I prefer to eat asparagus raw – always delicious. Steve I have a wonderful picture of you in my mind on your bike with sticks of asparagus on your back rushing through the traffic. Great blog and educational as well, what can I say.